Nov. 2016: "Migración internacional: patrones y determinantes. Estudios comparados Colombia-América Latina - Proyecto LAMP" now published! The LAMP was born as an extension of the Mexican Migration Project (MMP), which was created in 1982 by an interdisciplinary team of researchers to advance our understanding of the complex processes of international migration and immigration to the United States. LAMP's purpose is to extend this research to migration flows originating in other Latin American countries. LAMP began operations in 1998 with a set of surveys conducted in Puerto Rico. It expanded later with fieldwork carried out in Colombia, Dominican Republic, El Salvador, Nicaragua, Costa Rica, Haiti, Peru, and Guatemala. Ecuador is the most recent country in which we conducted fieldwork Spring 2012. In addition, a modified version of the LAMP survey was implemented in Paraguay to study migration from that country to Argentina. 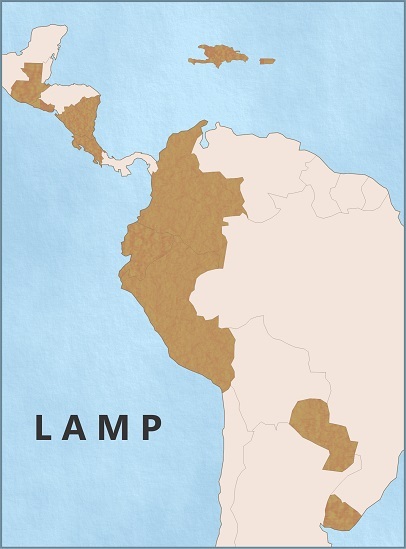 The surveys in Nicaragua and Costa Rica were made possible through an association between the LAMP and the Central American Population Center of the University of Costa Rica. The surveys in Paraguay were designed and implemented by an associated project between LAMP, the Centro de Estudios de Población (CENEP) in Buenos Aires and the Sociology Department at Duke University (click here to find out more). The surveys in Guatemala were made possible trhough an association between the LAMP and the University of San Carlos in Guatemala. The surveys in El Salvador were made possible through an association between the LAMP and the Sociology Department of Texas A&M in College Station. The surveys in Colombia were made possible through an ongoing association between the LAMP and the Red de Universidades Públicas del Eje Cafetero - Alma Mater. During different periods, we have received support from Fundación Esperanza, la Pontifica Universidad Javeriana, and the Fundación Universidad del Norte. Colombian surveys in Spain were made through an association between LAMP and the Instituto Universitario de Estudios sobre Migraciones - Universidad Pontificia de Comillas in Madrid, Spain. The surveys in Ecuador were made possible through an association between the LAMP and PYDLOS of Universidad de Cuenca in Ecuador. Data from Colombia, Costa Rica, Dominican Republic, Ecuador, El Salvador, Guatemala, Haiti, Nicaragua, Paraguay, Peru and Puerto Rico are avilable, and can be downloaded from this website. In 2018, LAMP started collaboration with Facultad de las Ciencias Sociales, Universidad de la Republica de Uruguay in Montevideo to study recent migration arriving to Montevideo from Venezuela, Peru, Cuba and Dominican Republic. This is work in progress.